Played both national and Inetrnational on the same day. Great courses, awesome staff and the shower facility was great at the end of the round enabling us to directly head to the airport. Will certainly play here again on my next golf trip to Orlando. Best condition of the Champions Gate courses, reasonably wide open, greens role well. Greens were hard as a rock. Impossible to stop shots on them. Glad we moved our tee times to the afternoon, would have hated to pay full price. Good condition. Good value. Easy to get to. Tee shop staff very unhelpful and close to being rude. All greens have recently been rebuilt. They were very hard and did not hold incoming shots. Tee boxes and fairways needed some work. With a little love this can be a good track. Great opening day course. Lots of open space. Back nine was especially naturally beautiful. Will return for opening day play.Good pace of play. The Fountains at ChampionsGate, a brand new community, is comprised of exquisite 1-, 2-, 3-, and 4-bedroom townhomes featuring extravagant interiors with stainless steel appliances and resort style community pools, all surrounded by natural protected conservation land. Each townhome also has a private lanai and an attached 1-car garage. Guests may also enjoy the 10,000-sq. ft. European style spa and fitness facilities. The resort is conveniently located close to many of the area's premier golf courses. 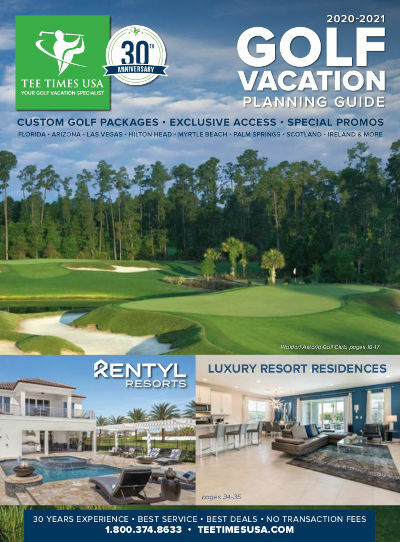 Within the ChampionsGate community you will find two Greg Norman designed championship golf courses, the International and National as well as the brand new, private ChampionsGate Country Club. Four nights accommodations at Fountains at ChampionsGate in a four bedroom townhouse based on quad occupancy. One afternoon round on ChampionsGate International with power cart. One afternoon round on ChampionsGate National with power cart. One afternoon round on ChampionsGate Country Club with power cart. One morning round on Providence with power cart. * This $367, 4 night / 4 round package special is based on a trip May 20 - May 24, 2019. * 4 nights accommodations at the The Fountains at ChampionsGate in a 4 Bedroom 3.5 Bathroom Townhome with five beds and a pull-out couch, based on quad occupancy. The 3rd night free special must be booked by 2/28/19.